An Apple patent application published on Tuesday backs the company's apparent interest in using micro-LED technology in future products, one possibility being the Apple Watch. The application, discovered by AppleInsider, was most recently submitted in November 2015, but is a continuation of another application dating back to April that year. Titled Micro device with stabilization post, the document describes a away of stabilizing LEDs and microchips on a carrier substrate so they're able to be transferred to another substrate. Notably the patent makes direct reference to LuxVue, a company specializing in micro-LED technology that Apple bought in 2014. One of the credited inventors —Andreas Bibl —was the CEO of that firm, and was recently credited on another Apple micro-LED patent involving wearable technology. 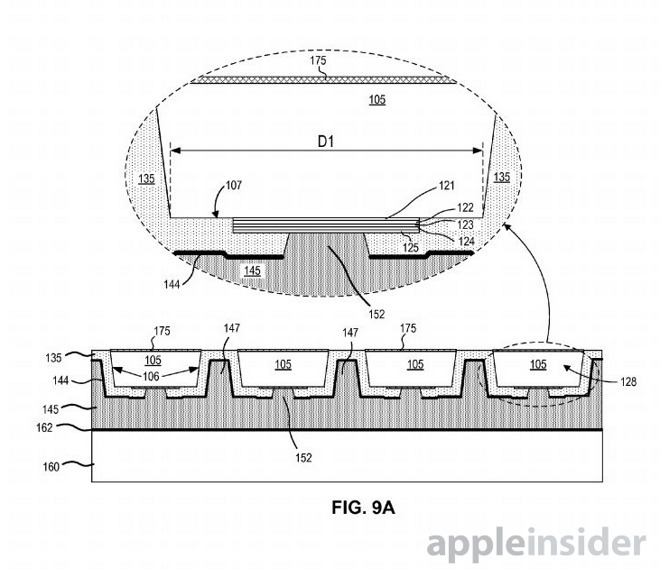 Both patents may support rumors that Apple is working on a micro-LED display for a future version of the Apple Watch, potentially shipping as soon as the second half of 2017. That exact timeline may be unrealistic, since micro-LED has yet to feature in any shipping consumer products, and it's currently difficult to manufacture panels of any significant size. Cost is another factor, as even the OLED panels used for the first-generation Watch are more expensive than conventional LCDs —Apple isn't expected to use OLED on iPhones until next year.